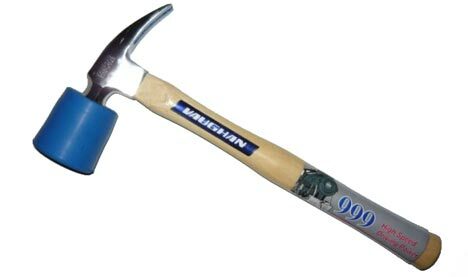 No, the Hammer Bumper does not protect your hammer during unwanted accidents. It does, however, protect your striking surfaces from your hammer. The Hammer Bumper, quite simply, converts a hammer into a mallet. By slipping the Hammer Bumper over any hammer face that is 1-1/8” to 1-5/16” in diameter, you can turn that hard steel or titanium face into a much softer non-marking rubber face. Why would you want this? Well, instead of carrying around both a hammer and a mallet, you can now carry your hammer and a much smaller, much lighter, Hammer Bumper. I have always been a fan of simple products that make the job a little bit easier; the Hammer Bumpers looks to be one of them. For around $7, this USA made product seems well worth the price.